Another love of mine are cactus and for ease of growing and breathtaking beauty, you can't beat Epiphyllums. They grow like a Christmas Cactus on crack. 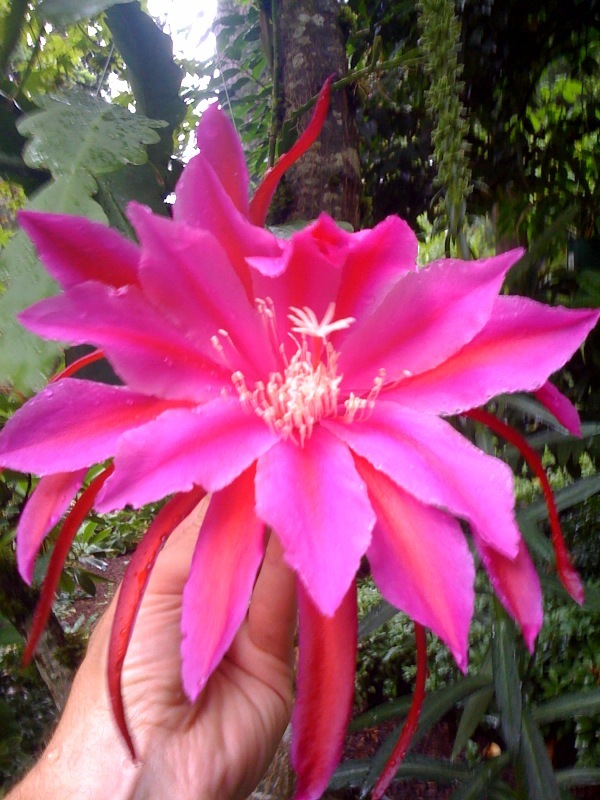 The only downside is that the flowers only last for about 2 days, but even then, an electric pink flower as big as your head is hard to beat. Best if grown in a basket so that they can hang, but I have recently seen them grown in pots with tomato cages to hold them up. I hang mine outside in the shade for the summer and hit them with the hose when I am watering the shade perennials. They winter in the garage under grow lights, because there is no room for them elsewhere. Just be careful not to give them too much cold or too much water over winter - you don't want them to rot. They also seem to flower better with a little neglect, which I am happy to accommodate.